If the above jumble doesn’t conjure in your mind the image of red and orange bursting through the day break to light the Pride Lands of the African Savannah, there are only two possible explanations. 1. You haven’t seen Disney classic, The Lion King (what? ), or (much more likely), 2. my written rendition of Elton John’s ‘The Circle of Life’ didn’t do the song justice. 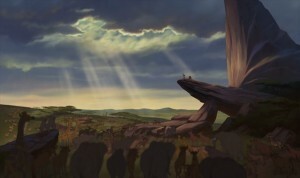 If you’ve seen The Lion King, you likely associate the film with the song which plays during its opening scene. The score evoked such strong emotions within viewers that it became iconic of the film itself. Chills slid down our spines and hairs rose on our necks when the shot of grazing gazelle played with a particular set of notes. The image of a gypsy-like monkey standing on a rock, holding up a severely concerned looking lion cub to thousands of bowing creatures was transformed by music, so that it was not absurd, but a prolific statement about the connection shared by all living things. Not a Disney fanatic? No worries. Pick any film and think of the moment which made goosebumps speckle and pinprick your skin, or tears fall from your cheek, and I can almost guarantee you that your physiological reaction was at least partly caused by the music chosen to play in the background. It doesn’t take much to see that music is an incredibly important aspect of a film’s ability to evoke emotion. Music is so important to our emotional response and expression that anthropologists like Mithen argue that humans were making music before they were speaking, and studies show that babies understand songs earlier than language. We are made melancholy by dulcet tones, excited by fast paced melodies, and super creeped out by little girls singing in dark rooms. But why does this happen? How do film scores trigger such an onslaught of emotion? Throughout your life, you have listened to thousands of hours of music; the average person hears approximately 6 hours of music each day. From this exposure, your brain has identified certain patterns in music which occur frequently, such that it has a pretty good idea of what is statistically likely. Consequently, you have two kinds of ‘expectancies’ (things you unconsciously expect to happen) when it comes to music: ‘veridial’ and ‘schematic’. ‘Veridial’ expectancies are those things you expect based on having heard the song before. Schematic expectancies are those you expect based on all the music you’ve heard in the past. For example, we all expect notes to be as long as each other, and for chords to follow similar chords. These expectancies shape how we feel when we listen to music. The interplay between what you expect and what you don’t causes you to feel emotions. Music which is entirely statistically likely bores us. Music which is entirely statistically unlikely is hard for us to understand and so weirds us out. Music which plays with our set of expectancies, however, hits our emotions. We feel tense when musicians do statistically unlikely things. This tension is released by the musician either returning to what’s typical, or by surprising us by doing something different. For instance, the Jaws theme song creates tension by repeating a set of statistically unlikely notes for a statistically unlikely length of time; it is so strange to us that we feel uneasy and frightened, and begin to search the screen for danger (cue glimpses of a terrifying shark). If the same scene was set to statistically likely music, this tension would not be present and the audience may not feel frightened. The song used during Hitchcock’s infamous Psycho shower scene works on a similar basis. Because personal expectations play such a dominant role in the way we respond to a film’s score, there can be a large discrepancy between the emotional reactions of different groups of people to the same scene. For people who were raised in India surrounded by Hindi style music, for example, a Bollywood scene might cause wails and sobs where it would confuse an Australian viewer with no previous exposure to that type of music. A masterpiece can be made by its music. ‘(I’ve had) the Time of my Life’ plays on repeat in our minds for hours after the mention of Dirty Dancing and the Harry Potter series is inseparable from its theme song. Our emotional response to the crucial moment in a film’s plot line is often heightened or even reliant upon the song which plays in the background. Although it is justifiable to revel in the brilliance of The Lion King’s animation crew therefore, perhaps we should first tip our hats to the composers of its score. This entry was posted in Film, Music and tagged music, Score, The Lion King. Bookmark the permalink.